We were once again commissioned by BT Sport productions to produce illustrations that were to be used as part of the build up to Roma v Barcelona, which was broadcast on BT Sport 2. The concept was based around the greatest ever Champions League comebacks (Roma were 4-1 down from the first leg going into this game) and the producers had the idea to theme the clip around the Empire Strikes Back. 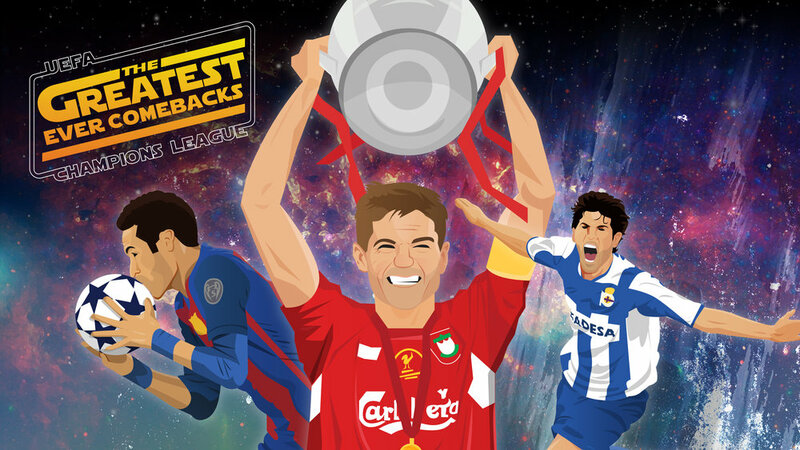 Our illustrations were based on players and moments from UCL history that saw amazing comebacks. We themed the backgrounds to mimic the iconic Empire Strikes Back poster. We also created a logo that was loosely based on Star Wars branding. Unbeknown to any of us, Roma were to pull off an incredible 3-0, writing their own names into that long list of amazing UCL comebacks! The work was seen throughout the montage of video clips, as well as sitting on screen during the live studio discussion. Players illustrated included Steven Gerrard, Kevin De Bruyne, Edin Dzeko, Gonzalo Higuain and Neymar.